If it's only for practicality's sake, I would have continued dreaming of working and living in any part of the world like in the US, Singapore or Indonesia. Aside from dreaming that I was a Princess in long, flamboyant, pink gown, it was a childhood dream of mine to be able to go to different countries or work abroad and get rich faster. In 2006, I had a chance to be assigned in Jakarta. I felt privileged among my peers to be able to do that. But if there's one thing that most Filipinos in other countries do, it's finding a community and getting together during off-work to feel closer to home and temporarily forget about homesickness and look for something familiar, the genuine Filipino smile and a ready helping hand. It made me think, why would I desire to be in another country, when other nationalities would like to stay and live here? Let's take for example Ms. Anna Rabtsun-Baylosis. She is a Russian married to a Filipino who was swoon by the thoughtfulness and sweetness of her husband while he was still courting her. Now, they have two children and has been living in the country for two years. She’s proudly embraced the Filipino culture so much that she not only speaks and understands Tagalog quite fluently, she also sings in Tagalog. An inspiring love story and something na truly nakaka-proud as a Filipino. Clearly, not only she fell in love with her husband, but also with the Filipino traditions such as having close family ties and pagmamano. Ang #SarapMagingPilipino dahil ang Pilipino ay hinding hindi mo matitinag kahit siya ay may pinagdadaanan o may mabigat na suliranin sa buhay. Ang problema para sa isang Pilipino ay BOOM PANES! 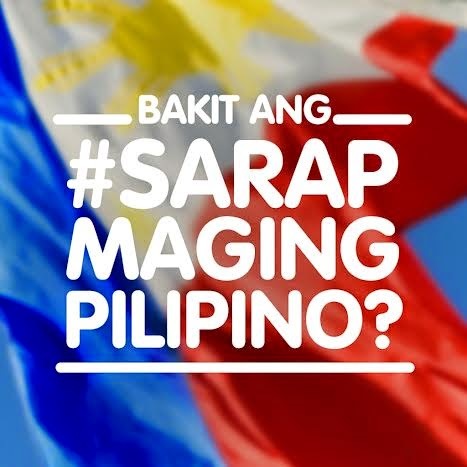 Ngayong Araw ng Kalayaan, ipagmalaki nating lahat kung bakit ang #SarapMagingPilipino! Para sayo, bakit ang #SarapMagingPilipino? or let's start a discussion on Twitter too! I'm LOUISE FANDIÑO and I am 100% proud to be a FILIPINO!